The project is for those who have at least 5 years of experience in carpentry and have at some point in time started studies in carpentry at Upper Secondary level. The project is coordinated by Idan – Vocational and Educational Training Centre and is based on a validation model/methodology developed by the Education and Training Service Centre (ETSC). Portfolio work, interviews and simulations/observations are the main assessment methods used. 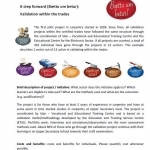 About 80% of those who go through the validation project continue with their learning in an Upper Secondary School towards their craft examination.